“The Most Dangerous Game... Night!” ended with Louie closing the door with a “LOUIE INC.” sign on the front. The episode provided the green triplet with enough confidence and inspiration to plan for the future. In the opening moments of “Storkules In Duckberg,” we see that he definitely has an endgame vision, but no idea how to start the process of getting there. He wants to be a businessman, and he wants to be rich, and it’s clear he’s ready to “do a business” to reach that point, but the old Louie is still thriving around inside there, with a nonsensical business pitch, a bunch of blustering corporate talk, and the request for 2.5 billion dollar “loan.” Scrooge laughs him out of the room, of course, but not before offering him advice: finding a problem, and offering a solution to that problem, should be the basic vision of his business. He, Huey, and Webby, try to brainstorm solutions, but they’re all a bust (Potato-ade has promise!). But then, during a “corporate retreat” at Funzo, he witnesses Storkules battle a number of Harpies who attack the sad, sad amusement park-themed business, and lo, his problem is solved. For now. Remember Storkules? He was a favorite among the show’s writers who returns as Donald’s roommate, mostly to create a number of cartoonish and sitcom-esque, Odd Couple-like gags, which are fairly funny, if mainly because Donald is always great in these kinds of situations. He is eventually hired by Louie to fight off the Harpies around Duckberg in exchange for money, which allows LOUIE INC. to thrive. It goes so well that they eventually capture all the Harpies, which is an actual good thing, except that it puts Louie’s business in danger. He grows so desperate that he almost releases the Harpies to jumpstart it again (especially since he spent all the money on merchandise instead of actually paying his employees). A plot contrivance between Louie and Storkules inadvertently leads to the Harpies escaping anyway, and the winged creatures manage to lift Donald’s houseboat up into the sky, leaving Louie, Donald, and Storkules to fend for themselves. Yet an errant comment from Louie (the Harpies merchandise being his most loved possession) allows for the three to manipulate the Harpies into piloting the houseboat back to safety. Honestly, there isn’t much to really say about this episode. It feels like a perfectly fine 10-pager of the comic, or one of the more average episodes of the original show. There isn’t much in terms of commentary (there’s a bit of Louie not listening to Huey or Webby making obvious or well-intentioned advice). There isn’t much in terms of thematic cohesion (a few characters reiterate a line about characters or situations being the problem and/or the solution, but it never ties into anything substantial or revealing). There’s isn’t much in term of character development (I like that the writers combined Louie’s new-found desire to be in business with his penchant for laziness, his gift of gab, and his get-rich-quick schemes, but he doesn’t seem to grow from this, except to exploit the whole situation with Scrooge when he conveniently arrives with the solution in a can). It’s fun, though–a nice, silly adventure with a couple of solid gags and one really exciting, visually-nifty climax on top of Donald’s houseboat as it’s being carted off by Harpies. I’m a bit lost on how they managed to get back home (Louie didn’t have that much merchandise to toss aside in order to control the direction of where the Harpies flew), but overall it’s an episode with a coherent beginning, middle, and end, with a tight, if perfunctory, adventure through it all. 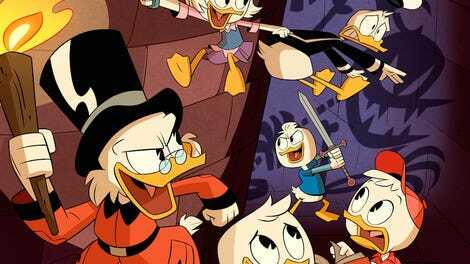 DuckTales is allowed to coast once in while, letting its characters be their silly, wild selves, with its sharp animation and passable Bob Snow script keeping things lively and moving. I’m also not sure why the thing that the Harpies loved the most was lemons. It seems like it was established just to make the ending work, without establishing a narrative basis for that love. It’s not something from Greek mythology, that’s for sure! I last observed that Storkules was mostly another version of Glomgold in his first outing. But now that Glomgold has been re-established as a potential real threat, it looks like Storkules will replace him? Especially if he is indeed staying with Donald. This is the second episode that dealt with the fallout of not paying workers. 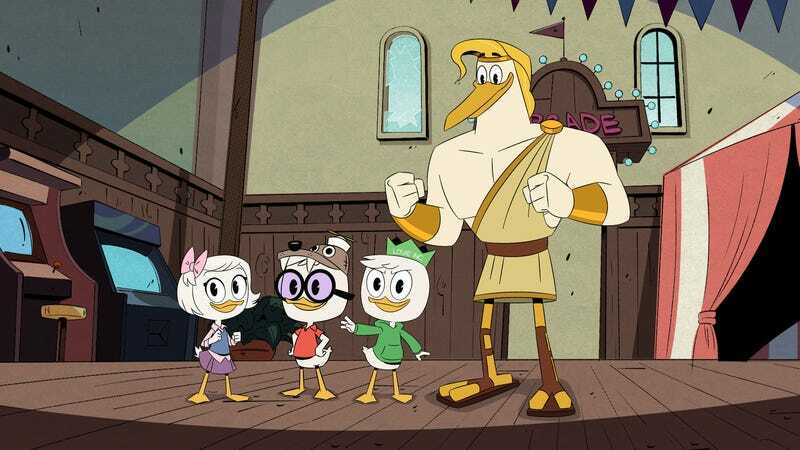 DuckTales has always, if occasionally, reached for raw commentary of the insidious side of business, but has to be careful not to, you know, say too much about that, lest its young viewers start to question Disney themselves.